“Landas” is the Filipino word for “way,” a Biblical term of venerable standing. This is not the first time that a theological journal has chosen to call itself by this name. The editors of Landas were attracted to this title largely by its capacity to express the notion of faith as pilgrimage, faith as lifestyle, and faith as authentic orientation. The decade leading to its inaugural issue in January 1987 saw a notable growth of interest in the realities and developments of what had been called the Third World. From the perspective of religion and mission, the significant, if not remarkable multiplication of Christian membership in such areas of the globe had important repercussions both on Christian dynamics and ecumenical affairs. The phenomenon of Basic Ecclesial Communities and the rise of liberation theology in Latin America served to intensify the focusing of attention on developing nations. For the Philippines, the historical events of February 1986 which saw the toppling of a 20-year-old dictatorship through a peaceful, non-violent revolution attracted world-wide interest, which gave rise to various questions. What are the people of South and East Asia thinking? What are they saying? What are they writing? When these questions were directed to matters theological, there was a seeming lack of printed sources from which to draw the answers. In the Third World situation, after all, demands of involvement rendered leisure for scholarship a rare commodity. 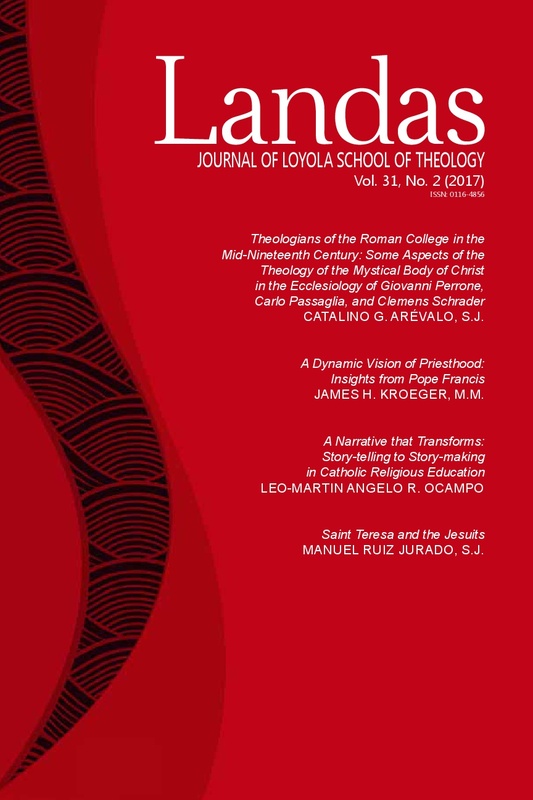 Thus was born the theological journal Landas, with hopes to make a modest contribution toward responding to the need for published material on scriptural, ecclesiological, and spiritual topics, written by authors living and working in the Philippines. From its founding editor Antonio B. Lambino, S.J. Landas trekked its own path, with stewardship subsequently transferring to Pedro C. Sevilla, S.J., Pedro S. de Achutegui, S.J., Daniel Patrick Huang, S.J., James H. Kroeger, M.M., Miguel B. Lambino, S.J., Antonio Francisco B. de Castro, S.J., Jose Mario C. Francisco, S.J., and now Felipe Fruto Ll. Ramirez, S.J. Now on its 29th year, Landas looks back at a fruitful and relevant publication history, and is set to respond to contemporary audiences amid the challenges of today’s digital world. Felipe Fruto Ll. Ramirez, S.J.